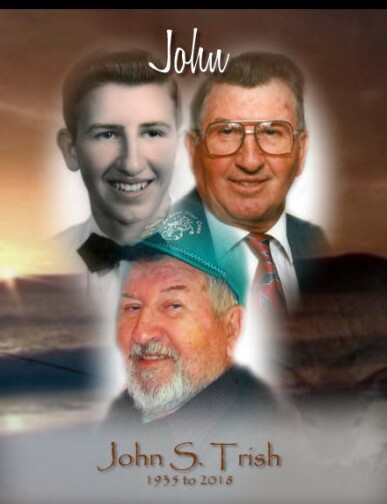 Obituary for John S. Trish | Kenworthy Funeral Home, Inc.
John S. Trish, 82, of Hanover, PA, entered God’s eternal care, Monday, September 3, 2018 at home with his loving family by his side. Born September 6, 1935, in Deep Run, MD, he was the son of the late Delphia Trish and Cora May (Coppersmith) High. He was the loving husband of the late Joyce L. (Raubenstine) Trish with whom he shared fifty-seven years of marriage and who died April 17, 2012. John was a 1953 graduate of Littlestown High School. He served his country proudly in the United States Army. Mr. Trish retired from Alloy Rods/ESAB after twenty-seven years as a rewinder. He was a member of the North American Hunting Club; and enjoyed fishing and hunting and spending time with his family. John is survived by his children, Wade A. Trish and wife Tammy Jo of Spring Grove, PA, Kathy A. Trish of Hanover, PA, Tony A. Trish and wife Lori L. of Abbottstown, PA and John A. Trish and wife Cheryl of Abbottstown, PA; five grandchildren, Shannon W. Trish, Lisa M. Trish, Tyler J. Trish, Tanner W. Trish, Toby A. Trish; three step-grandchildren, Krista E. Bollinger and husband Dakota, Amanda N. Shanefelter, and Autumn R. Shanefelter; three great-grandchildren, Brooke, Bristol and Briana; and three step-great-grandchildren, Maci, Alexis and Emma; a brother, Earl Trish of York, PA; and a sister, Charlotte Kane of Baltimore, MD. He was preceded in death by siblings, Charles Trish, Helen Feeser, Ruth Geeting, Laura Baugh, Mary Hurley. A funeral service to celebrate and remember John will be held 10:00 AM, Saturday, September 8, 2018 at the Kenworthy Funeral Home, Inc., 269 Frederick Street, Hanover, PA, with the Rev. Philip K. Nace officiating. Burial will be in Mount Olivet Cemetery, Hanover, PA. A viewing and time to share memories with the family will be held from 6:00-8:00 PM, Friday, September 7, 2018 at the funeral home. In lieu of flowers, contributions may be made to the American Cancer Society York/Adams, Attn: Memorial, 924 N Colonial Avenue, York, PA 17403 in memory of John’s wife, Joyce L. Trish.